July 7, 2013: Acquittal for the Iraqi oil workers’ leader Hassan Juma’a was finally achieved on 1 July. 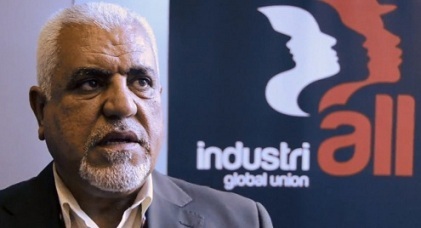 The sham judicial process persecuting Hassan for organizing workers was defeated after four months of trade union campaigning supported by international solidarity. Basra court hearings, originally tabled for 20 March, 7 April, 15 April, 2 May, 19 May, 3 June, and 17 June were all postponed when the Ministry of Oil, the Southern Oil Company (SOC) and its legal representatives consistently failed to provide any evidence in support of their claims that Hassan Juma’a was guilty of undermining the Iraqi economy by organizing illegal strikes and publicly criticizing the privatization of Iraq’s oil. The 1 July hearing took less than 30 minutes to reach the decision to drop the charges after the company lawyer and the prosecutor repeated the accusations against Hassan but at the same time confirmed that there were no damages caused by Hassan’s activities. The prosecutor asked to close the case and drop the charges. On this occasion Hassan’s lawyer did not even need to present his defense. If convicted he would have faced stiff fines and up to three years in prison. This is the first time an Iraqi trade unionist has been charged under penal code 111-1969, an archaic law that the Saddam Hussein regime used to repress state employees. 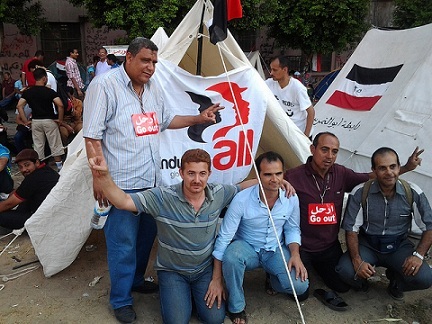 IndustriALL Global Union mounted an international campaign in support of Hassan. 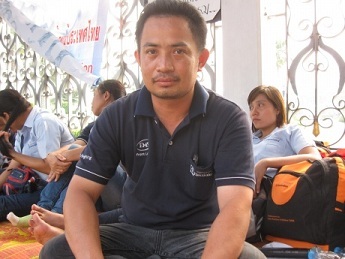 He attended the recent IndustriALL Executive Committee, where, following a passionate presentation of the situation, delegates from around the world pledged their support for him and his union and called for these sham charges to be dropped immediately. This case underlines the importance of the international campaign for a just labour law in Iraq. Repressive Saddam-era labour legislation has to be replaced through a process that includes national trade unions and establishes laws in line with international standards and fundamental principles of the ILO. 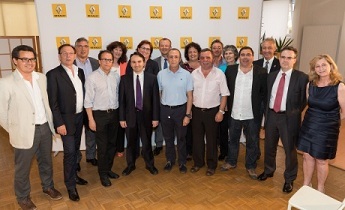 July 3, 2013: Industriall Global Union, the Renault Group and the Renault Group Works’ Council jointly commit to promote workers’ rights and sustainable development. 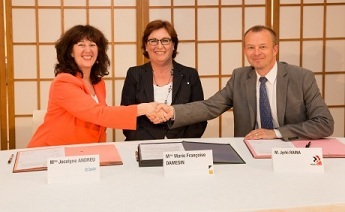 The Renault Group manufactures vehicles under three brands – Renault, Dacia and Renault Samsung Motors – and has an alliance with Nissan since 1999. It operates in 118 countries with 38 production sites and employs 127,000 people worldwide. 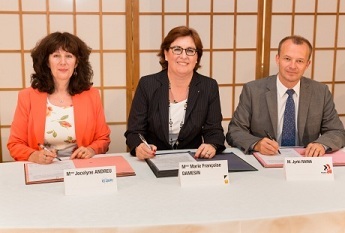 In 2012 the Alliance inaugurated a plant in Tangier, Morocco, that is expected to have some 6,000 workers by 2015. July 4, 2013: IndustriALL, IF Metall and Electrolux management have reached an additional agreement for full reinstatement of the suspended union leaders and withdrawal of the court case against them. 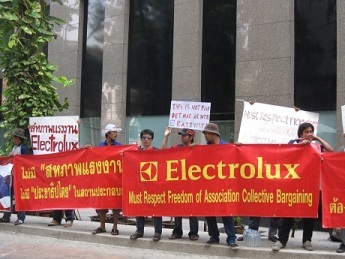 Over recent months, IndustriALL Global Union together with Swedish affiliate IF Metall have been actively pushing for a just solution including full reinstatement of the suspended union leaders at the Electrolux Rayong plant while the industrial dispute in deadlock. against the members of the union by receiving the agreed application for reinstatement with the applicant’s signature on. All parties are committed to contribute to the development of social dialogue and mature industrial relations between the social partners and conduct joint training to support both the union and management in the Rayong plant. IF Metall, the former IMF, and Thai affiliate TEAM actively engaged in organizing the Rayong plant in 2010 and soon after that ETWU was formed to represent the workers’ interests. IndustriALL and IF Metall will continue to support the workers and the union leaders to re-vitalize the union activities and to create stronger unity at the plant. 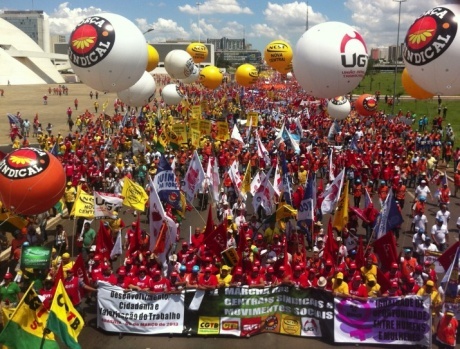 July 4, 2013: The trade union centres, including the CUT and Força Sindical, which have IndustriALL affiliates as member unions, believe the organised participation of the working class to be an essential component of the wave of social protest sweeping across Brazil. They are organising rallies, stoppages and strikes to take place on a National Day of Struggle on 11 July. The National Day of Struggle, organised jointly with other social movements, is calling for a positive outcome to the current situation. The trade union movement has joined the protests attended by millions of people throughout the country who have been calling for a reduction in public transport fares and improvements in public transport, health, education and expressing their dissatisfaction with the way in which political institutions are operating. There have already been concrete results because the authorities reduced public transport fares in most cities and towns. However, there is still a deadlock over the question of political reform. Congress is debating the issue but all sectors of society must be involved in this debate. The National Day of Struggle will call for the withdrawal of Bill 4330 on outsourcing, which is an attack on Brazilian workers’ rights and makes work even more precarious in Brazil. This bill must be withdrawn immediately from the agenda of the National Congress. The Constitution and Justice Commission of Congress is due to vote on the Bill on 9 July. The trade unions have organised a day of strikes in the main sectors of the economy on 4 July as a warning to Congress to withdraw the Bill before the demonstrations, stoppages and strikes to be held on 11 July. The National Day of Struggle will call on the authorities not to make cuts in expenditure on social services to compensate for the reductions in public transport fares. Other demands include: 10% of the national budget for public health; 10% of GDP for education; “public funds are only for the public sector”; an end to the pensions factor; 40 hour working week without a reduction in pay; land reform and suspension of the tendering process in the oil industry. The unions will also call for the democratisation of the media and for a plebiscite to decide on political reform. The CUT believes that resources are available to invest in improving public services and criticises the way in which billions of public money have been given to employers in the form of exonerations, exemptions and subsidies without the employers providing anything in return. Billions more are used to swell the primary surplus to pay the national debt. The CUT will prioritise strikes in various sectors of the economy. The strikers will include their own specific demands as well as those formulated by the wider movement. Miguel Torres, president of the CNTM, the metalworkers’ confederation affiliated to Força Sindical, which is affiliated to IndustriALL, said: “We are at an important moment in the life of our country, with important changes in the economy, in the use of public resources and the definition of social and political priorities”. He added: “the workers are protagonists in this movement, they are the people who are really building the nation and have always been ready to go out onto the streets to protest and demand their rights, and to participate in the national political arena in order to fight for improvements to living conditions”. 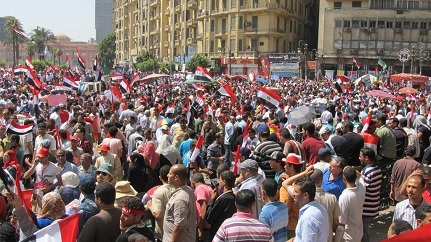 July 3,2013: Cairo resounds to the calls of “Irhal! Irhal!” (“Leave! Leave!”), as 14 million people march across Egypt demanding the President resign in one of the largest demonstrations seen in the history of the world! Huge protests across Egypt calling for the resignation of President Mohammed Morsi began on 30 June, 2013 and continued throughout the night. Millions of protesters across the country accuse the country’s first Islamist president of failing to tackle economic and security problems since taking power a year ago. Egypt’s economy is in free-fall: the pound has dropped in value by nearly 20 per cent since Morsi took office, and many businesses are paralysed by widespread fuel and electricity shortages. Public anger has soared over expanding power cuts, water cut-offs in some districts and falling living standards. Human rights abuses remain widespread, rights groups say, with president Morsi’s administration doing little to rein in the notoriously brutal security services. As the first anniversary of his election approached people opposed to President Mohamed Morsi had already rallied in Cairo’s Tahrir Square for three days calling for him to resign, while his supporters vowed to defend his legitimacy to the end, leading to fears of confrontation. The army deployed tanks and other military vehicles in the streets of Cairo. The anti-Morsi protests were organised by a grassroots campaign calling itself Tamarod, meaning “rebellion” or “insubordination”, which claims to have collected signatures from 22 million Egyptians demanding the president’s departure. The campaign has united many liberal and secular opposition groups, including the National Salvation and many ordinary Egyptians, angered by Morsi’s political and economic policies. The independent trade unions are strong supporters of the campaign with the Egyptian Federation of Independent Trade Unions (EFITU) and Egyptian Democtratice Labor Congress (EDLC). According to EFITU statement announcing their participation in the 30 June protest against the President, the situation for workers in Egypt has worsened after they played an integral role in removing ousted President Hosni Mubarak from power in 2011. They also criticized the current government for being put on a short-term blacklist by the International Labour Organization and asked why, after two years of discussions, the government had yet to pass a new law concerning union freedoms. So far in Egypt workers are given prison sentences for striking, while in the same time the government stays silent at 4,000 factories being shut down and causing thousands of job losses. Regrettably, in one of his recent speeches, president Morsi has publicly blamed electricity workers for the current electricity outage crisis and accused them of bribes. 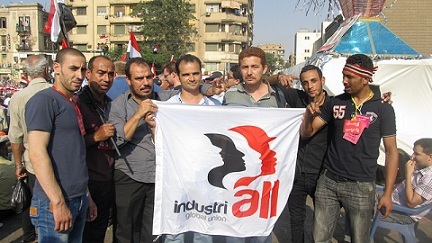 http://www.industriall-union.org/a-first-national-strike-in-egypt. In his comment to this insult Wael Akl, president of the IndustriALL Egypt affiliate the General Trade Union of Electricity and Energy (GTUEE) said, “instead of appreciating the efforts of electricity workers in such hard times, the president exposes our members’ lives to more risks due to his direct accusation of bribery as this would incite violence against electricity workers” and urged the president not to blame workers for his government’s failure. Most workers hope 30 June is the date that marks the beginning of the end of the Islamic group that came to power with Mohamed Morsi exactly one year ago. The new unions are fighting for survival and IndustriALL Global Union is strongly supporting their struggles. Following the continued demonstrations and strikes the military gave a 48 hour ultimatum to the President, which at the time of writing is running out.